It’s really surprising how many human foods are toxic to our Dobermans (and all dogs for that matter). Things we don’t often think about, which are often out and available – like chocolates in a dish, broccoli on the table, our evening beer and even grapes. The toxicity and danger varies depending on the food or beverage, the dog and his age and the amount consumed. 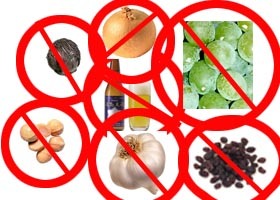 Grapes, raisins, onions, garlic, macadamia nuts, chocolate (especially the dark and baking), potato peels, green potatoes, moldy and spoiled foods, tomato leaves – stems – green parts, caffeine products like soda, coffee, tea, coffee grounds, coffee beans, yeast dough, beer hops, alcohol, tobacco and tobacco products. Additionally, broccoli, apple core pips, pear pips, peaches and apricots, plum kernels and the list goes on and on. Best to stay with dog treats for dogs! Hey, even some kibble from the regular food can be a treat to a dog.